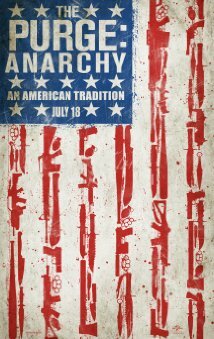 I admit that despite a solid performance from Ethan Hawke I was disappointed by the first Purge (2013, James DeMonaco) movie but I thought I might as well give The Purge: Anarchy a go anyway, and was pleasantly surprised. The original Purge was set within the confines of one house and shot in more of a ‘Paranormal‘ style, ‘Anarchy’ is set on the streets of Los Angeles and has far more places to go both plot and location wise. Anarchy follows three sets of people who are brought together by unlucky circumstance on purge night and must work together to survive. As working together for the good of the group is exactly the opposite of what society expects from them on purge night, this turns out to be a bit of a challenge. 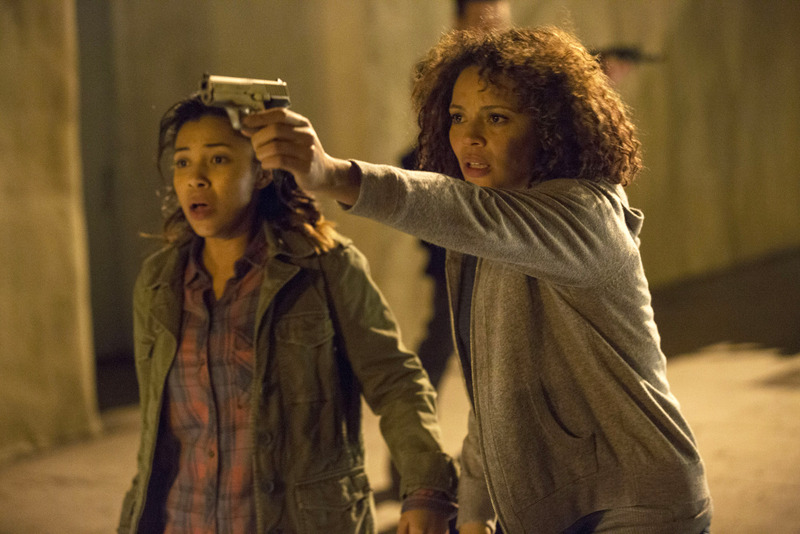 The main couple; mother, daughter duo Eva (Carmen Ejogo) and Cali (Zoe Soul) hope to wait out the purge with their father/grandfather in their small apartment in a poor area of town. Grandfather is sick and sneaks out leaving the girls alone and confused. A mysterious elite force surrounds the building and captures the girls to use in a high ranking official’s private purge. (This guy get driven around in the back of a truck with a Rambo style machine gun) But luckily ‘Sergeant’ (Frank Grillo) arrives, taking pity on the girls he takes most of the armed men out saving the pair. Sergeant is a mysterious character who is armed to the hilt and looking to enact a specific plan of revenge on someone who has wronged him. Dressed in black he is almost like a vigilante Batman figure. Sergeant and the girls head for his car where they discover Liz (Kiele Sanchez) and Shane (Zach Gilford) sheltering. The soon to be divorced couple had been driving back home when their car broke down and have been chased across the city by a masked gang. The now very angry machine gun guy recovers from being shot and shoots at the car, the bullets damage the engine immobilizing the group. Seargant reluctantly has to adjust his plans to help the misfit group get across the city to Eva’s friend’s house in exchange for a car. 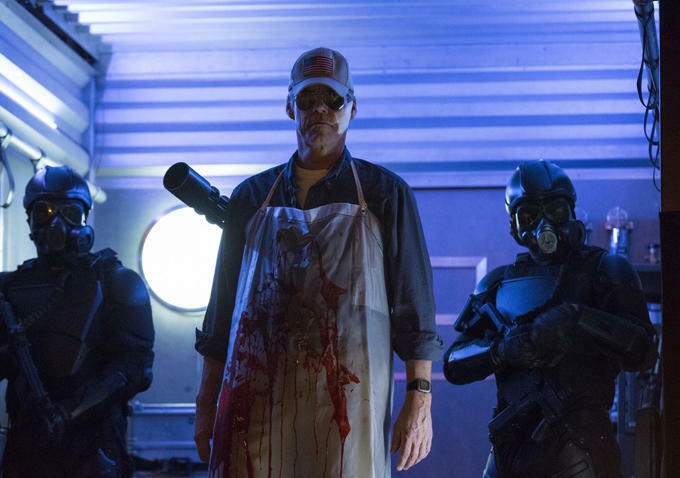 Considering that the purge society exists in an alternate style future Anarchy has a lot of interesting themes that mirror issues facing contemporary American/Western society. In the film, the riches ‘top 1%’ have the power to buy poor people to kill privately in the safety of their security protected homes. The concept of this film is clearly born out of the banking crisis, and subsequent recession. The government tells the population that purging ‘cleanses’ the perpetrators in the eyes of God. Here Anarchy is mirroring the increasing lack of separation between state and religion in America. Those interested in purging talk about their ‘God-given right’ to purge given to them by the ‘new founding fathers,’ this ideology is backed up by government broadcasts and national media. This can be seen as a reference to Americas pro-gun lobbies who often site the 2nd amendment given by the founding fathers as a right. In Anarchy, (one could argue is also the case in reality) state and religion become perversely blurred, the right to purge (bear arms) is more important than ‘thou shalt not kill,’ the new founding fathers are treated as Gods, and their chosen people are wealthy Americans. Anarchy comments heavily throughout on the agenda of the gun lobbies, big business, and the government. Poor Americans are more likely to be affected by gun crime on purge night. 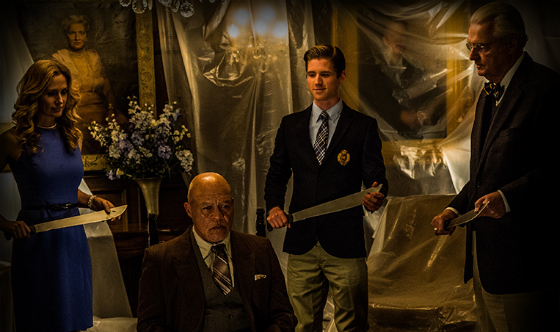 The purge is used as a form of social cleansing rather than soul cleansing. Eva and Cali are both smart, strong African American women. Cali understands that the purge is really about big business; as long as purge night continues gun manufacturers, retailers and security firms will make money, and as we are all sadly aware in capitalist society money equals power. Cali is interested in the videos of an underground anarchist group who are anti-purge and believe that the government literally uses the purge as an excuse for social cleansing. This idea seems fanciful until government gunmen drag them from their home. The government sends out mobile purge units (black trucks, filled with troops and government officials who are up for personal purging) to keep track of the purge night action, increase kill rates in poor neighborhoods, and capture poor targets for ‘personal purges.’ The anarchists, led by Carmelo (who are reminiscent of the Black Panther Party) fight back against the government forces. Anarchy also references the American civil rights movement here because Eva and Cali are hardworking, upstanding citizens, but the black (and Hispanic) community are heavily targeted during the purge. Spoiler alert. Unusually for the current horror scene The Purge: Anarchy has a positive anti-revenge message at the end and an even more unusual happy ending. The post-post-modern era really has been the era of not just the unhappy ending but the cynical unhappy ending. It’s nice to have a change. But don’t forget it’s only a year until the next annual purge. I highly recommend this film.